Zener is back! And Kung-Fu Cinema is ON! While I was able to appreciate my alone time when Z-boy was gone (it’s so lovely to be able to write without distractions! ), I missed him dearly. Every time I watched a movie, I’d think about how much Z would have enjoyed it, and missed his laughter and exuberance. Snake in the Eagle’s Shadow (1978) – an early Chan movie, the first of his iconic comedy infused kung-fu style. It’s a fun movie and features many (most?) of the same actors as Drunken Master (1978). Jackie Chan plays an orphan at a kung-fu school who is maltreated by the instructors, but soon befriends an old beggar who happens to be one of the last remaining masters of the Snake Fist style. The Snake Fist school is being systematically destroyed by the Eagle Fist masters (for no adequately explored reason, as Douglas Adams would say, but hey, it’s a kung fu movie, it’s not about the plot!). The fighting is excellent, and pretty near bloodless. One rather huge issue, for me, is the scene where a cobra and cat are fighting. Hong Kong cinema had no rules to protect animals from harm during filming, and I fear that both the cat and the snake came to serious harm. I skip the scene (fortunately, it’s only about a minute or two). Zener loved the Cat Claw style, and has made constant attempts to use it against me since watching the movie. I have scratches. The English dubbed version is available for free viewing on Crackle. Fearless Hyena (1979) – Another early Jackie Chan film, made after his huge successes with Drunken Master and Snake in Eagle’s Shadow. This one is more serious and dramatic, yet it still features Chan’s comedic style. The fight at the end is stupendously complicated and wonderful to watch. The plot for this one is more traditional, and revolves around Chan’s character’s, path of revenge. Which is apparently a very typical plot device for Kung Fu films, but as I’m new to the genre, it’s not a cliche yet for me. This one is a tad more brutal than the others we’ve seen so far, but still pretty cartoonish. Zener was on the floor laughing for many of the comedic fight scenes. We also decided that Jackie Chan was adept at “Bum-Fu” and “Tickle-Fu”. Zener was already familiar with “Tickle-Fu”, since that is my primary style of defense against his attacks. So I told him that if he wanted to be strong like that, he needs to work on his push ups! And he did do a much better warm up set in Karate after viewing this movie. Chan-spiration strikes! Bonus: chop stick fight, which undoubtedly provided the inspiration for the one in Kung Fu Panda. 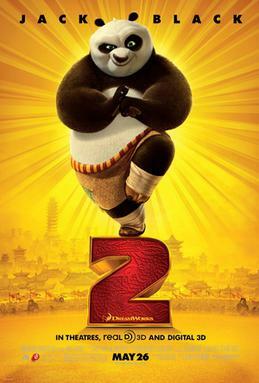 Kung Fu Panda 2 (2011) Both movies in this animated series are wonderful films, and Zener and I enjoy them greatly. The second film is darker and more serious than the first, but still beautifully done. Bonus: Do I detect hints of Shaolin Soccer in the final showdown between Po and Shen? Methinks I do!